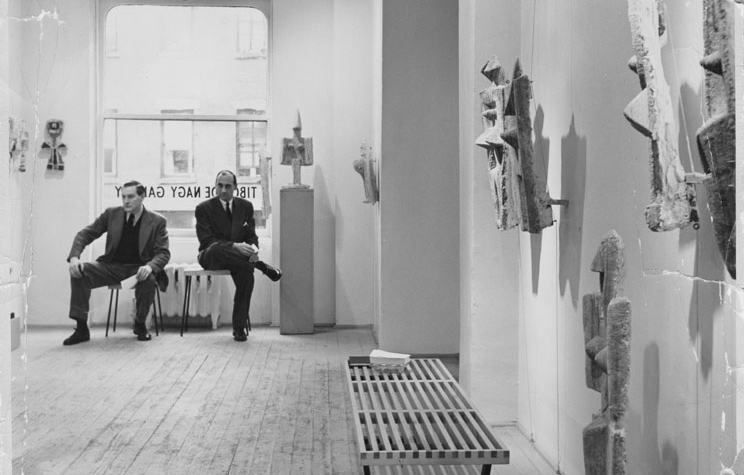 Tibor de Nagy founded the gallery in 1950 with John Bernard Myers. The gallery distinguished itself as a salon for artists and poets through exhibitions and collaborative publications under the Tibor de Nagy Editions imprint. The current owner is Andrew Arnot, who joined the gallery in 1989 and was mentored by de Nagy. Arnot became an owner in 1993 upon de Nagy’s death. The gallery has had several different locations, starting on East 53rd Street and later moving to Fifth Avenue and 57th Street, among other locations. In June 2017, the gallery moved to 15 Rivington Street on the Lower East Side. Tibor de Nagy Gallery presents exhibitions of such contemporary artists as Kathy Butterly, Sarah McEneaney, John Newman and Trevor Winkfield, as well artists from the Post War Second Generation New York School such as Jane Freilicher and Fairfield Porter, and represents the estates of John Ashbery, Joe Brainard, Rudy Burckhardt, Shirley Jaffe, Jess and Larry Rivers. Over the course of its long history, the gallery has presented the first solo exhibitions of Carl Andre, Helen Frankenthaler, Jane Freilicher, Red Grooms, Grace Hartigan, Alfred Leslie, Fairfield Porter and Larry Rivers. The gallery has a history of fostering collaborations between poets and artists and was the first publisher of the poems by New York School Poets John Ashbery, Frank O'Hara, Kenneth Koch and James Schuyler. The gallery has presented many significant exhibitions over the last several years. They include Joan Mitchell (2002), Shirley Jaffe (2010), Francis Picabia (2010), Sam Francis (2011), Jane Freilicher (2013), Fairfield Porter (2016), Larry Rivers (2017) and Painters & Poets (2015), an historical survey of the gallery’s history upon its 65th anniversary. Andrew Arnot joined the gallery in 1989, and was mentored by Tibor de Nagy, an admired art dealer who co-founded the gallery in 1950. Upon de Nagy’s death in 1993, Arnot became an owner. In the years since, Arnot has honored the gallery’s history while expanding its vision and refining its program. Arnot has organized hundreds of gallery exhibitions and overseen the publication of many catalogues. Some of the more significant exhibitions he curated were solo shows of work by Rudy Burckhardt, Sam Francis, Shirley Jaffe, Jess, Joan Mitchell, Francis Picabia, Fairfield Porter and Larry Rivers. He has placed important works by gallery artists and historical artists in several major museums and private collections. He has served as a board member of the Art Dealers Association of American Art and has juried several exhibitions, including shows at PS 122 and The New York Studio School. He received a B.A. in Art History from Michigan State University.